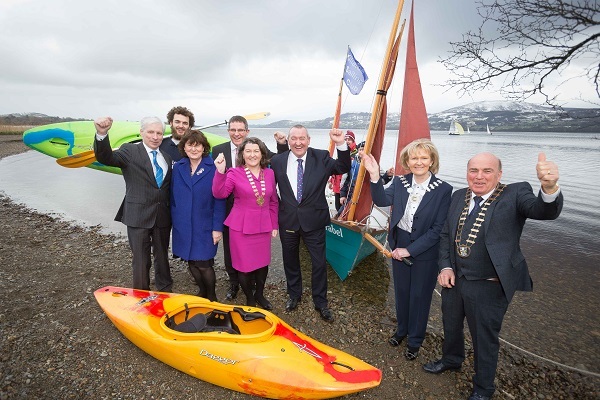 The Lough Derg Blueway was officially launched on Tuesday 6th March 2018, a special ceremony in Killaloe in the presence of providers of commercial and recreation service providers around Lough Derg. The Lough Derg Blueway was officially launched on Tuesday 6th March 2018 a special ceremony in Killaloe in the presence of providers of commercial and recreation service providers around Lough Derg. The launch of the initiative is the culmination of a successful partnership between Clare, Tipperary and Galway County Councils, the Lough Derg Marketing Group and Waterways Ireland, and is supported by the Lough Derg communities and businesses who have embraced the project from its inception. A Blueway is a multi-activity recreational trail on or alongside idyllic lakes, canals and rivers with easy access to canoe and bike hire, maps and trail information. With easy access and many starting and finishing points, these trails are family and group friendly whether it’s for a weekend away or a daily walk. Packages and activities can be found on www.BluewaysIreland.org. The Lough Derg Blueway builds on the untapped potential of the existing waterway infrastructure and is enhanced by attractive rural towns and villages of Portumna, Dromineer, Killaloe/Ballina, Scarriff, and Mountshannon. With 21 individual paddling trails, Lough Derg as the largest lake on the River Shannon offers its own unique Blueway experience. The Lough shore provides achievable paddling, walking and cycling trails including heritage trails with over 90 heritage sites and access to the long distance routes of the East Clare Way and Lough Derg Way. Waterways Ireland’s Chief Executive, Dawn Livingstone said, “The partnership between Clare, Galway and Tipperary County Councils and the Lough Derg Marketing Group has delivered the Lough Derg Blueway to this point. It is the local community groups, individuals and businesses who have come together to provide activity and who will continue to enthusiastically market and promote the Blueway who will ensure it thrives, growing recreation and tourism participation and creating jobs. “I particularly want to acknowledge the Department Of Arts, Heritage, Regional, Rural & Gaeltacht Affairs which last year allocated €200,000 under the Rural Economic Development Zones (REDZ) initiative for the marketing, promotion and sustainable development of the Blueway,” he added. Cllr. Phyll Bugler, Cathaoirleach of Tipperary County Council, has encouraged the businesses around Lough Derg with a vested interest in tourism to capitalise on this opportunity to promote and package the Blueway.